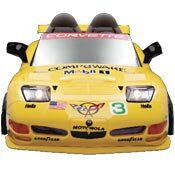 Corvette C5-R Power Vehicle,$299.99 at Toys ’R’ Us Times Square (866-742-6423). 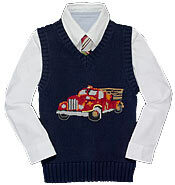 Tommy Hilfiger white shirt, $29.50, tie, $22.50, and fire-truck vest, $39.50, available at Macy’s. Sweet Tulip’s three-piece enamelware set, in blue, pink, or yellow, $34 (877-698-8547). 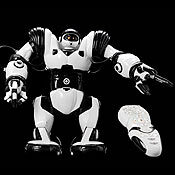 Robosapien performs 67 preprogrammed moves, including whistling, dancing, and karate, $99 (robosapienonline.com). 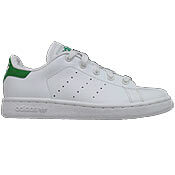 Adidas Stan Smith sneakers, $50 (adidas.com). English tweed velvet-trimmed dress, $125 at Spring Flowers (212-207-4606). Custom backpack by Viv Pickle, $65 to $70, depending on fabric and accessories (212-924-0444).